← 100 Cents Minus One. How You Can Help Too. Hiff there! This is Bumble again. I need to tell you something that happened this morning when I took mom for her regular walk in the nearby nature reserve. Those of you who have already read my book know that place. Lots of interesting things always happen there. And again this morning I witnessed a drama! No, I’m not being overly dramatic, you’ll see. First when we arrived there, I was reading my morning paper in the bushes. Small birds were singing and everything was peaceful. I was just resting under a tree after the long run and watching a squirrel when I heard a bird cry! It was a big bird’s cry, very loud. I almost hurt my neck trying to see where it came from. Mom pointed up towards the blue sky and I saw that there was a nest on a big platform. Mom said it was an Osprey family. She knows these things. I saw the mama bird still crying and the papa bird just arriving to help her! Then I saw why she was crying. 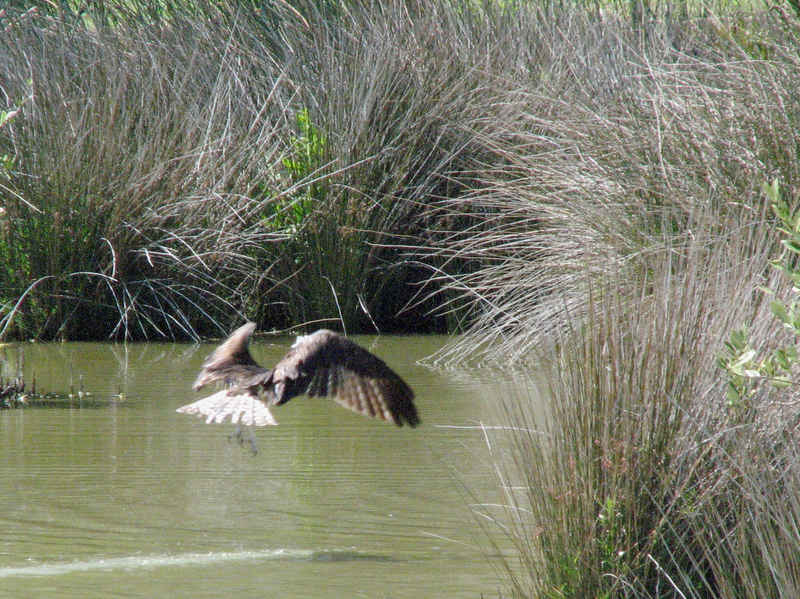 There was another big bird, very similar to them, circling around the marsh where the nest is! But it seemed to me it was hungry for fish as it soon flew down, its wings almost touching the water. And then it just flew away. Mom and I went down to the water and guess what? 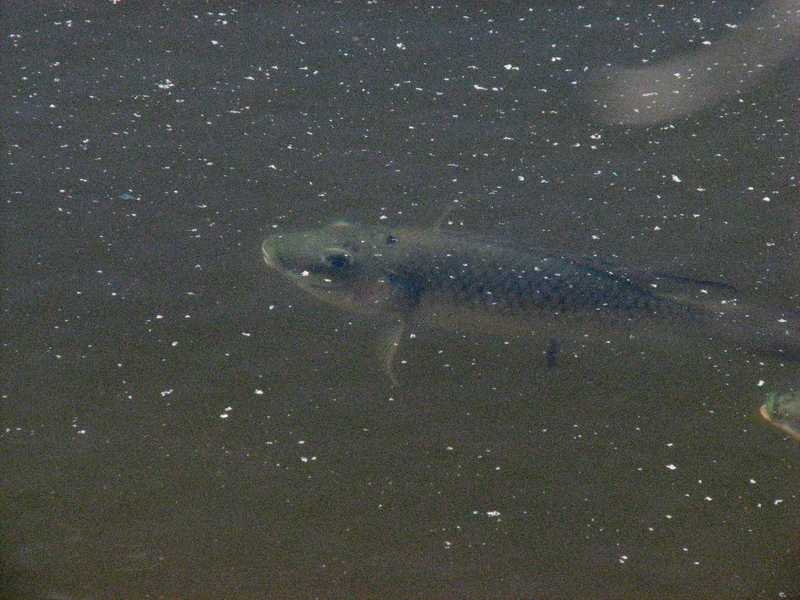 We could see the fish, it was still there, just under the surface in the dark water. It got lucky this time! 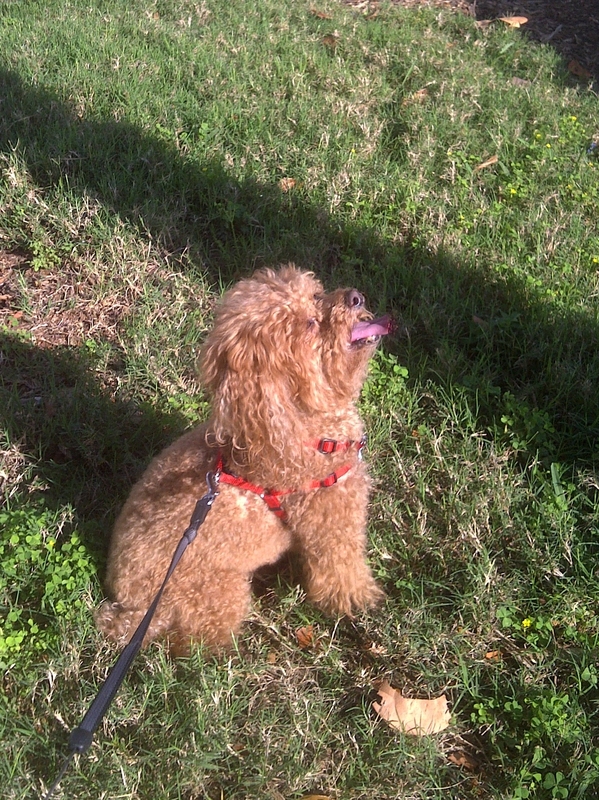 Soon peace was restored and I could continue walking mom. 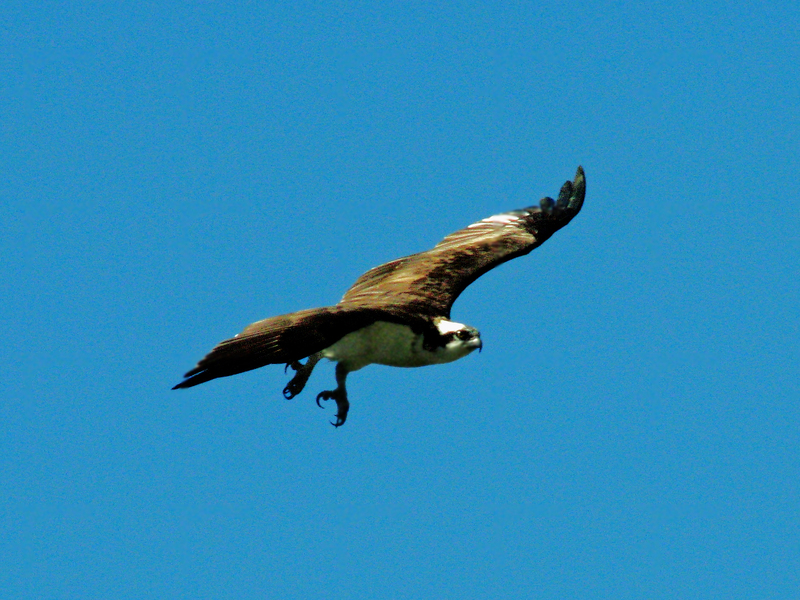 When we left the park, I could see the papa Osprey flying away, maybe for a fishing trip in the bay. He was so big! When he passed right above us, I tried to walk very close to mom. I’m always on protective duty. 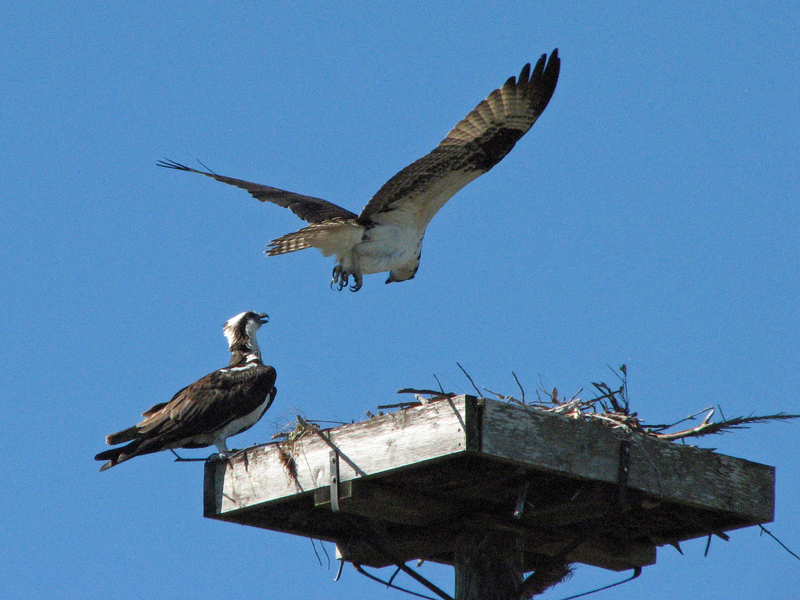 Mom told me the Osprey family is expecting baby birds. I want to come back later to see them getting flying lessons. That would be awesome! You know he is the trainer 🙂 And he always finds the adventure, I just need to follow him! Awesome! I’m almost at the end of the book! 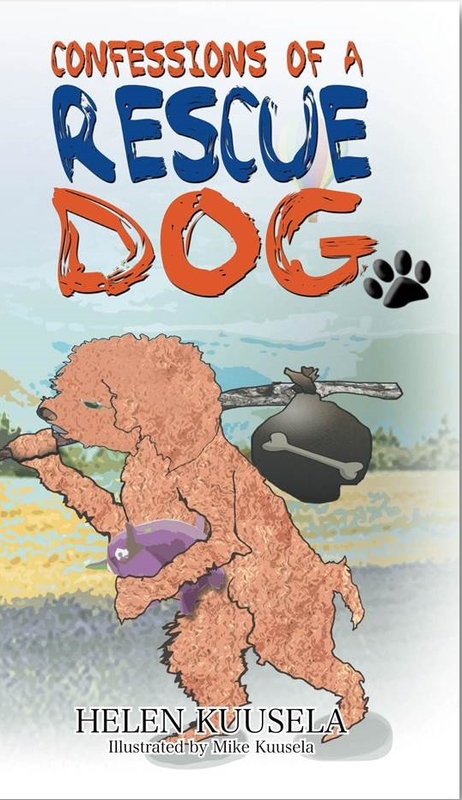 I will most definitely review the book on Goodreads and Amazon as soon as I finish! How could I refuse that cute face? We have one happy dog here! You are welcome! I’m happy I could tell the story of the big birds …and protect mom all the way home – B.